"They're trying to screw us! I'm going to tear you down…" The Orchard has debuted the first official trailer for an indie drama titled The Hummingbird Project, which already premiered at the Toronto and Vancouver Film Festivals last fall, arriving in US theaters this March. You don't want to sleep on this one. The film is the latest from Quebecois filmmaker Kim Nguyen (War Witch, Two Lovers and a Bear, Eye on Juliet), a thriller about two high-stakes traders with a plan to build a straight fiber-optic cable line between Kansas and New Jersey, so they can make millions. But of course it's easier said than done. The cast features Jesse Eisenberg, Alexander Skarsgård, Salma Hayek, Michael Mando, Johan Heldenbergh, Ayisha Issa, and Sarah Goldberg. This is described as a "modern epic" that "exposes the ruthless edge of our increasingly digital world." This looks totally wild and captivating, I'm very curious to watch. Dive right in. Cousins from New York, Vincent (Jesse Eisenberg) and Anton (Alexander Skarsgård) are players in the high-stakes game of High-Frequency Trading, where winning is measured in milliseconds. Their dream? To build a straight fiber-optic cable line between Kansas and New Jersey, making them millions. But nothing is straightforward for this flawed pair. Anton is the brains, Vincent is the hustler, and together they push each other and everyone around them to the breaking point with their quixotic adventure. Constantly breathing down their necks is their former boss Eva Torres (Salma Hayek), a powerful, intoxicating and manipulative trader who will stop at nothing to come between them and beat them at their own game. 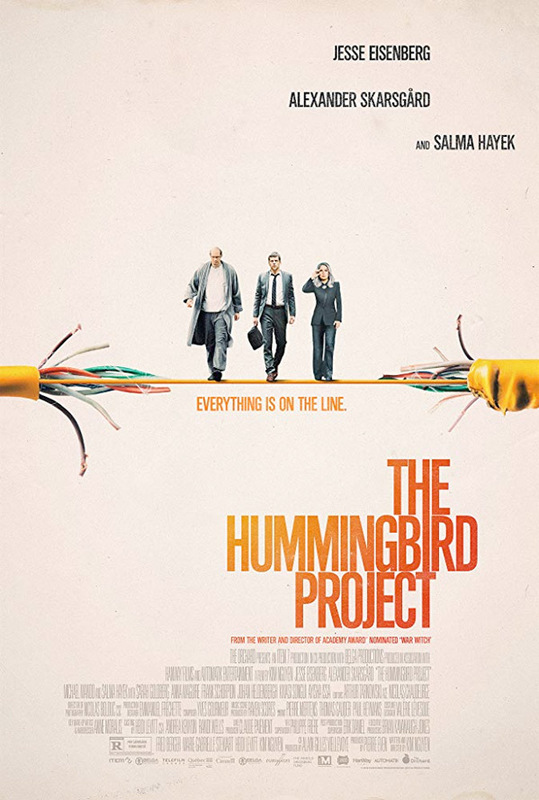 The Hummingbird Project is written and directed by Quebecois filmmaker Kim Nguyen, of the films The Marsh, Truffe, City of Shadows, War Witch, Two Lovers and a Bear, and Eye on Juliet previously. This premiered at the Toronto and Vancouver Film Festivals last year. The Orchard will release Nguyen's The Hummingbird Project in select theaters starting March 15th coming up. First impression?